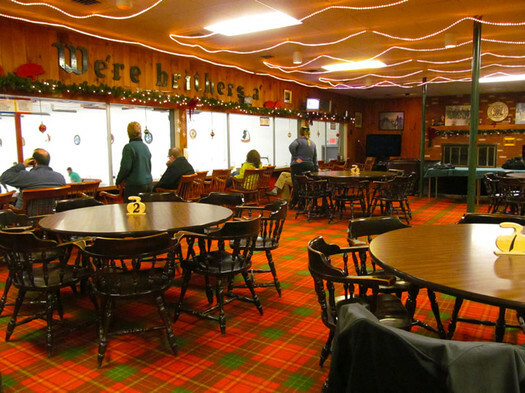 I got to the curling club a little after the start of a recent game and got a couple of glances as I entered the very Scottish-looking viewing room -- the plaid carpet extends up the wall (curling's roots extend back to Scotland). At first I thought it was because I had maybe picked the wrong outfit (jeans and sweatshirt are standard curling garb). But then I realized: I was an unfamiliar face. Curling clubs are a small community and everyone knows everybody. Curling usually runs in the family. So even the players out on the ice notice newcomers in the viewing area. It must be a little strange to see a stranger looking back. Wen I took out my camera to take photos, one player out on the ice just outright laughed at me. That said, visitors and newcomers are welcome. But as my roommate warned: "They will notice you, they will talk to you, and they will try to get you out on the ice." There's a certain coziness to being a curling spectator. You grab a drink, take a seat, take off your shoes (there was an unclaimed pair in front of my seat when I arrived, so someone out there is shoeless), throw a blanket over you, and enjoy the game. 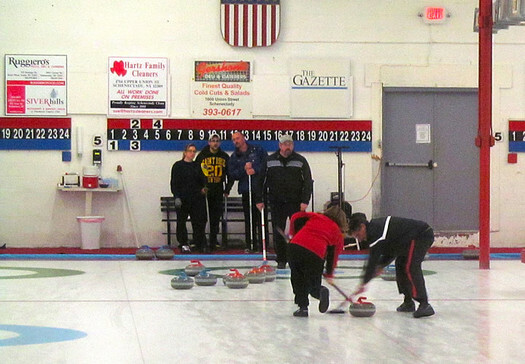 + Two teams play each other, each taking turns pushing a round weight down a lane of ice, trying to get it as close to the center of a target on the opposite end. + On its way down, two people furiously sweep the ice in front of the round thing for reasons I don't understand and then stop just as suddenly as they started. + Like pool, strategy includes knocking the other teams round thing away or hitting yours closer. Points are then added up after everyone shoots and a score is put on a strange scoreboard. No one is cheering or yelling, so you don't stand out if you're quietly trying to make sense of what's happening. I pretended pretty well that I was getting the hang of it -- until I had to ask: "So what do those brooms do exactly?" + That round weight thing they're pushing down the ice is called the "stone." + In one end, each player of each team "throws" the stone twice. Then they total the points and start the next end. + You earn points by having the closest stone or stones to "the house," or middle of the target. That that means only one team can score per end. + Kneeling close to the ice, the thrower delivers the stone by carefully pushing it, giving it the curl needed as well as the speed. + Two other teammates then use brooms to clear debris and create friction on the ice, depending on whether the stone needs to travel farther or come up short. + The player who's directing all this is called the "skip." Four players are working to get a stone exactly where they want it on the ice. Now, in all honesty, it took me about 30 minutes to begin to understand the game, but after watching for a while, I got the hang of it. But not the scoreboard. That I will never understand. The best thing to do, if you go to a curling match for the first time, is ask the person next to you to tell you the score. 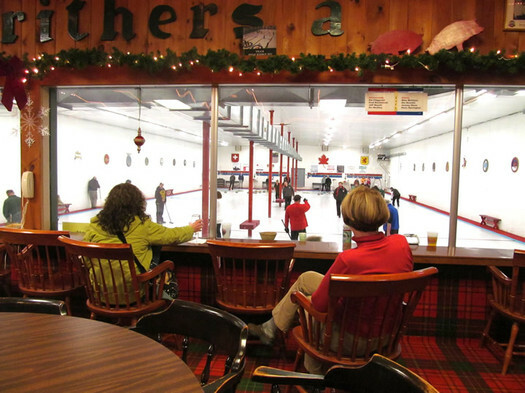 Most curling clubs offer a viewing room, not just for friends and family to watch the games, but also for the teams to meet after the game. Tradition demands that the winning team buys the losing team a drink after the game as they sit around a table, snacking, and discussing the game. Overall, going to the curling match was... relaxing. I like the idea of a sport that is tight-knit, informal (in some leagues), and friendly. 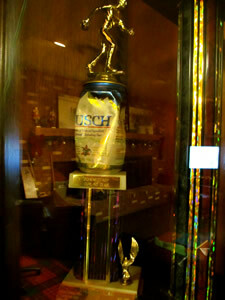 The players laugh, joke around and, sometimes, drink a beer while they're playing (though only from cans, glass isn't allowed on the ice). And even though I can barely stand on ice, I've already been told I'll be playing in the future. The curling family calls. If you are interested in curling, the Schenectady Curling Club offers a hands-on class for new curlers. 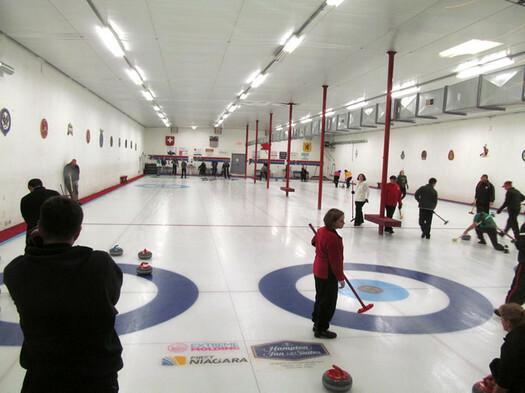 There's also an Albany Curling Club -- it has an open house coming up January 5. Everybody always wonders about the sweeping. The sweeping warms the ice, making is more slippery. When the stone is sent down the ice, the thrower spins it a little so it curves a little left or right as it slides. Hence "curling." Sweeping makes the stone go farther, but also straighter - with less curl. So the sweeping can actually steer the stone for a better shot. Chess on ice, we call it. I recommend reading up on Sandra Schmirler. World class curler. The scoreboard is a little strange at first but it kind of makes sense once you get it. The numbers up the middle on the black stripe is the running total of points. There is a numbered white square for each end. So in your photo above, Blue scored 1 in the first end. Red took the lead by scoring 3 in the second end. Blue tied it up by scoring 2 in the 3rd. Red took the lead again in the fourth to go ahead 5 to 3. They are currently playing the 5th end. In 1977, John Krauss and Eugene McDevitt of Niskayuna set the Guiness World Record for curling at the Schenectady Curling Club. The news made Sports Illustrated.